A Last Will and Testament (also referred to as a “Last Will” or simply a “Will“) is a document created by an individual, also known as the “Grantor” or “Testator”, which is used to layout how a person’s real and personal property shall be distributed after their death. 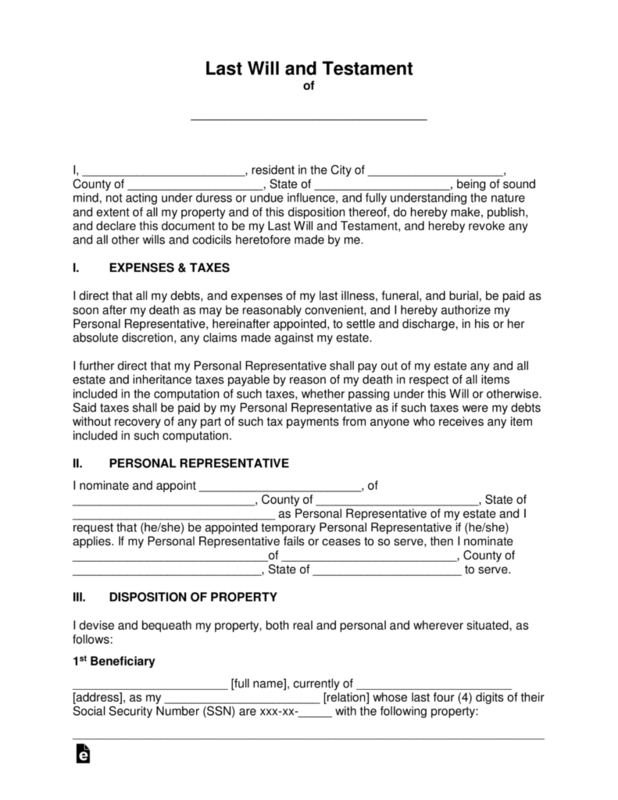 After the form is created, signed and notarized, the Will should be distributed to all the Beneficiaries stated in the Will and to the Grantor’s Attorney. No State requires the document to be registered but it may be filed with certain County Clerks, Probate Courts, and applicable Secretary of State offices. 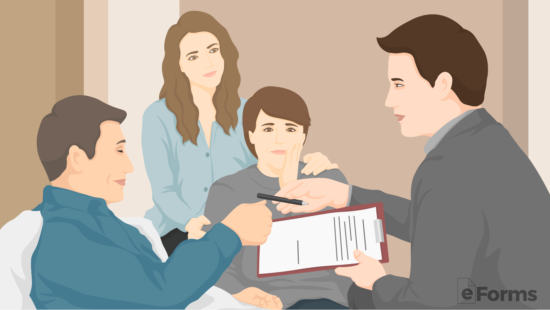 Signing Requirements By State – *Two (2) Disinterested Witnesses are required to make a Will valid (*Colorado and Louisiana require Two (2) Disinterested Witnesses and a Notary Public). Self-Proving Affidavit – Attach to a Will or Codicil for the witnesses to swear under oath that they were in the presence of the testator while they signed the Will. Is it Necessary to Have a Will? Which State Governs my Will? Which Types of Personal Property Can I Include? Can I Appoint Someone to be a Caretaker for my Pets? In order to avoid your property from going to the state upon your death, you need a document which details where and how your estate (houses, cars, money, internet related property etc.) will be transferred. The people who will be accepting your estate are called beneficiaries which are typically family members and charities. A Last Will allows you to assign an executor who sees that your Last Will is executed as instructed. Additionally, a Last Will and Testament allows you to appoint a guardian for your minor children. You want to set up a plan as to how your estate will be handled after death. Appoint someone to be a guardian of your children in the event of your death. You don’t want your estate transferred to or handled by your state/government upon death. In order to make a Will, an individual needs to identify the real and personal property in their estate and select who it would go to in the effect of their death. Once the form has been written the only requirement, under State law, is to have the Will signed in the presence of *two (2) witnesses that are not beneficiaries in the Will. *Colorado and Louisiana require a notary public in addition to the two (2) witnesses. Before writing the document, make an itemized list of all valuable assets containing personal and real property. Select which assets, unless all, should go to whom and inform the beneficiaries of your decision so that they may be able to financially prepare themselves for the transfer in the event of your death. Your assets should add up to 100% and allocate each beneficiary a percentage of your total assets. When distributing real property, give a detailed description of the property and to whom it will go. An executor is a person who will divvy up your assets and deliver them to the appropriate beneficiaries upon your death. 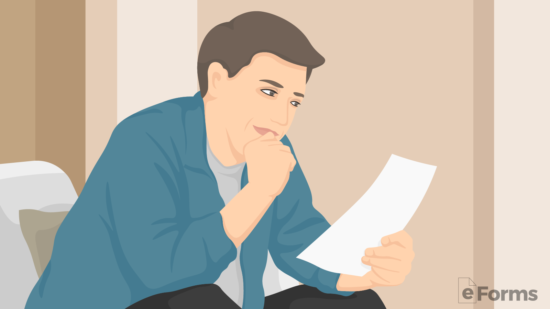 Select a trustworthy and educated executor, could be your lawyer or a close associate, that will carry out the instructions set forth in your Will. The primary job of the executor is to act in the best interests of your estate while settling debts (if any) and taking care of your funeral expenses. 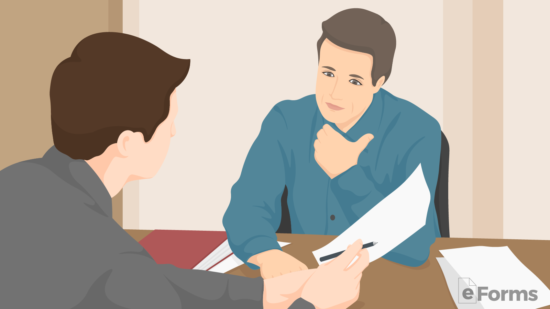 You can opt to appoint a secondary executor in the event your original executor is unable to carry out the tasks. If you have children under the age of 18, you need to appoint a guardian for your estate and for the care of your children. A guardian of the estate is responsible for overlooking the child’s assets/money and a guardian of the child acts as a parent and cares for their well being. One guardian may hold both responsibilities. When selecting a guardian, filter to make sure that this person can give adequate attention to your child and that this person is not a drug abuser. Your beneficiaries are the people and/or entities that will be receiving elements of your estate. Do you plan to give your entire estate to one person or do you have an interest in dividing your estate among multiple beneficiaries? A beneficiary, for example, can be a family member or even a charity. In the event a beneficiary within your Last Will dies, you need to decide whether the interest will go to their heirs or if the interest will be divided amongst the rest of the beneficiaries. 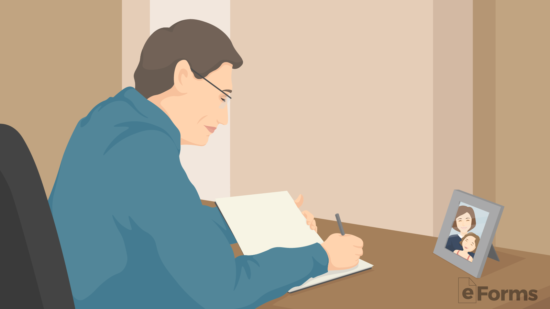 Your Last Will and Testament must be finalized with your signature in order to be valid. Each state has different requirements when it comes to witnessing requirements. Some states require two (2) signatories, whom can’t be beneficiaries to the Will and notarization. Therefore, no matter which state you reside, it’s a good idea to find at least two (2) witnesses to view the signing of the document and make arrangements to do this in front of a notary public. The Last Will is meant to be kept in a safe place with original copies provided to the beneficiaries and legal counsel. At the option of the testator, they may register the will with the probate court in their county (if applicable). Step 2 – Fill-in who will represent as the personal representative (also known as the ‘executor’) of the will. This will be the individual that will oversee the probate process and ensure that the decedent’s estate is provided to the rightful heirs. Their information should be entered with their full name and address along with any secondary personal representatives in the chance that the first (1st) is not able to act. Step 3 – Enter the beneficiaries, otherwise known as the people that will receive the testator’s personal and real property after their death. The document allows for the testator to state specific items to individuals or if there is to be only one (1) beneficiary the testator may enter ‘All real and personal property’. With this document, the testator may fill-in up to three people (describing them should include their full address, relation, and last four (4) digits of their social security number (SSN)) and if there are more individuals they should be attached or added to Section III. Step 4 – Enter the State that will govern the will. In most cases, the state inscribed will be that of the testator’s primary state of residence. Step 5 – The Testator should again, enter his or her name and date the will. They should then sign and print their name below. Step 6 – Find at least two (2) witnesses (most States require two (2) witnesses) that can attest to the will and sign. It is strongly encouraged the witnesses be disinterested from the will. For legal purposes, and so that the document is not contested by any third (3rd) party, the witnesses along with the testator should authorize the form with a notary public present. Every state has its own requirements for the legality of your Will. The state of your primary residence will govern your Will. Most states require that you have two witnesses attest and sign your Will. Find your state below and be certain that you know the requirements. Use the Codicil to a Will (or simply a “codicil”) if the testator has decided to amend their Will. This can be for any reason such as changing the executor, personal representative, beneficiary(ies), or any other facet in the transfer of the estate. 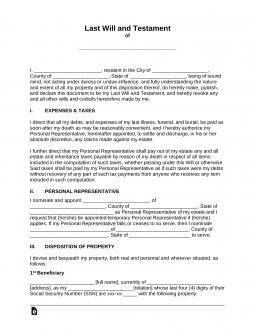 The Codicil is required to be attached to the Will and signed in accordance with State law. Self-Proving Affidavit – It’s recommended that when any Will amendment occurs through a Codicil that the two (2) witnesses authorize to swear, under oath, that they watched the signature of the testator. Both a Living Trust and a Last Will accomplish a similar goal, which is the delivery of ownership of one’s assets to their beneficiaries upon death. There are negatives and advantages to both but for most people, Living Trusts are seen to be the better option, especially with people of higher wealth. Probate court oversees your Last Will after your death. Allows you to appoint a guardian for a minor. Public knowledge after it is recorded. Does Not avoid conservatorship, which is when a court appoints a representative to handle your finances. However, a conservatorship can be avoided with a Durable Power of Attorney, which will allow you to appoint a person of preference to handle your finances in the event you become incapacitated. Probate court does not oversee a Living Trust. No jurisdiction. Does Not allow you to appoint a guardian for a minor. Private and therefore does not become public knowledge. Avoids conservatorship. The successor trustee that you appoint will be responsible for transferring your property. A Living Will is directed towards your health care preferences if and when you become mentally incapacitated. It allows you to appoint a Health Care Proxy who will then carry out your health care preferences. A Last Will and Testament is legally enforced after your death which deals with the transfer of your assets and personal property. If you care about your family and for those that love you, you will not go another day without a Last Will and Testament. It’s very important, especially if you are in the later stages of your life with a spouse and/or children. When a person dies without a Will, they leave their assets in the hands of the court system. 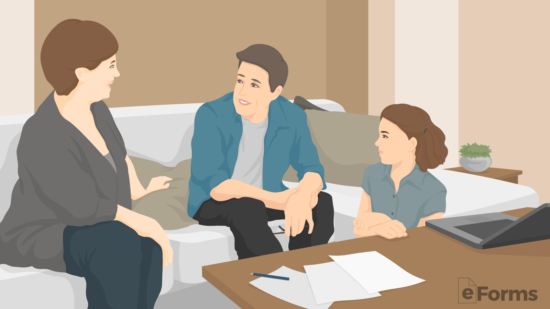 Because of this, disputes and confusion can easily arise between family members. No matter your age, if you have valuable assets and loved ones, make sure you have a Will set in place. Personal property is any type of item in your possession that has value (Important: does not include cash). Personal property includes vehicles, jewelry, collectibles, furniture etc. You may choose to give all your personal property to one person or you can proportionately allocate your personal property to multiple beneficiaries. If your primary beneficiary dies before you do, you can alter and remove that deceased person from your Will, otherwise, if you have a 2nd choice recipient/beneficiary, your property will go to that person. In some states that use the Uniform Probate Code, a beneficiary must survive for at least 5 days following your death in order to inherit your property. If there is no alternate beneficiary to inherit your estate upon your death, your Will would then be subject to your state’s “Anti-Lapse” Laws. Can I appoint someone to take care of my pets? Yes, in your Will, you can select a person to be the caretaker of your pets upon your passing. If there is no will that was recorded by the individual that has died (known as ‘intestacy’), and the estate is under the State threshold for probate proceedings, the property may be distributed through a Small Estate Affidavit. Use as a guide to ensure an individual’s estate is complete to the fullest extent by law as well as incorporate other end-of-life decisions. Power of attorney forms, for example, allow someone to choose someone else to make financial and medical decisions on their behalf if they aren’t able to do it themselves. In addition, a living will allows a person to make medical treatment requests if they should be incapacitated or decide if they would like their organs to be donated after their death.